Remember the days when if a movie was successful it would justify a sequel? Oh perhaps when such a sequel was successful enough to justify a trilogy? Well those days are well and truly over - today it's all about cinematic universes spread across multiple films in a year. In the context of Superhero mythologies, this makes perfect sense because the source material has been doing it for years and Marvel have done an admirable job of bringing that to the screen, which in turn bodes well for Disney's other massive franchise set in a Galaxy Far Far Away. It's only natural for DC and Warner Brothers to want a piece of the action, but without someone like Kevin Feige in charge, who's going to keep the wheels on the cart? Zack Snyder? 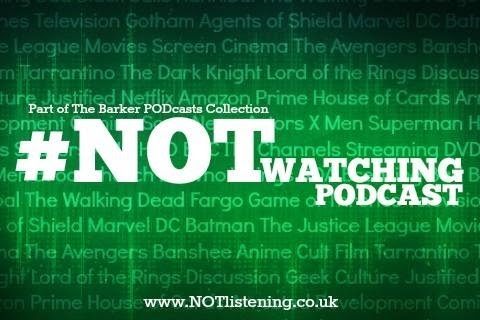 And don't get us started on Sony, whose ideas for multiple Ghostbusters sequels were already preposterous enough.... all this and more on another ranty news edition of the #NOTwatching Podcast!